We’d love your help. Let us know what’s wrong with this preview of Penguins Don't Wear Sweaters! by Marikka Tamura. You may have seen the cute pictures of penguins wearing sweaters--but did you know why they were wearing them? Debut author Marikka Tamura answers this question in this colorful, kid-friendly book that is told simply and charmingly. This uplifting, charmingly told story, tells what happens when well-meaning humans knit sweaters for penguins who've encountered an oil spill. To ask other readers questions about Penguins Don't Wear Sweaters!, please sign up. Be the first to ask a question about Penguins Don't Wear Sweaters! Don’t you love books that teach you something you never expected to learn? Like the author says, this may be a fictional story, but there is truth underneath the cuteness and unexpectedness. Who ever imagined penguins, or any other animals for that matter, wearing sweaters? That’s because they don’t and they shouldn’t. But sometimes they have to, or so people believe. Some think that it is necessary to dress penguins up so that they can function normally after oil was spilled into the sea. I want Don’t you love books that teach you something you never expected to learn? I want to applaud the author for the way she presented the issue in the story and the author note at the end. When I started this book, I thought it would be a cutesy fictional story with animals being personified by writers. I don’t mind that exactly, because fiction requires creativity, but I was extremely surprised when I discovered that the sweaters were not included so that the reader can swoon. In reality, sweaters can both help penguins and damage their health, which is made crystal clear in the author’s note. It turns out that the sweaters are more for the public’s eye than anything else. I’m glad this was alluded to in the story. Very eye-opening. I love that this book was published and I love even more that it was published by Penguin Random House. That’s a pun right there. I love penguins, T is sometimes unsure if penguins are real, and the cover is cute, so I thought this new acquisition at our library could be fun (and a reminder that they are real). Friendly looking penguins are dressed in sweaters in a misguided attempt to rehabilitate them after an oil spill. The narrative style reminded me of Uri Shulevitz's Snow, wasting no words. The penguins are healthy, then confronted with spilled oil, and finally returned to a blue sea. It is a gentle introduct I love penguins, T is sometimes unsure if penguins are real, and the cover is cute, so I thought this new acquisition at our library could be fun (and a reminder that they are real). The narrative style reminded me of Uri Shulevitz's Snow, wasting no words. The penguins are healthy, then confronted with spilled oil, and finally returned to a blue sea. It is a gentle introduction to ecological responsibility for a young audience. What I found most interesting was the author's note at the end, detailing the penguin-sweater events that led to this book. V: Did something bad happen to [the penguins]? V: What if you saw a penguin in the oil? What would you do? T: I would wear my snow boots! Snow boots don't get anything in them. They protect your feet. V: Did you like this book? What was your favorite part? T: Yeah. Where the penguins got icky and gooey. V: How did this book make you feel? V: What made you feel happy? T: How the penguins got helped. V: What animals would you want to help if you could help animals? V: Did you learn anything from this book? T: I learned that you should be careful with animals ... so that you don't hurt them. V: Is there anything else you'd like to tell me about this book? T: I would like to tell you that it was kind of neat...it was kind of neat because we haven't read it in a while. It might be spoilery, but I'm not hiding my review. I was expecting a super adorable book, but this was not that. I'm only giving it two stars instead of one because at least the illustrations were cute. I thought it was gonna be all about penguins and sweaters but no. It was about penguins and an oil slick and sweaters. It took a much different turn than I expected. The page that was like, "But WHAT is this? Something is floating in the water," I expected it to be a long thread of material and It might be spoilery, but I'm not hiding my review. A sweet and simple picture book with a powerful message about interpreting the media. How often do we just read the headlines, and perhaps a few lines after that? This true story is based on just that. A very worthwhile read for people of all ages! So, apparently, this actually happened? There was an oil spill and instead of people being like, "Let's clean these animals off and then make stricter laws about the transportation of a hazardous material," they just knit sweaters for the penguins. Cool. Thanks. Penguins probably died. Based on a true story about penguins, oil spills, and sweaters. Humans thought they were helping by giving penguins sweaters after an oil spill when this only created more problems for penguins. A great lesson how humans should solve the CAUSE of the problem, not the EFFECTS. Hello, friends! 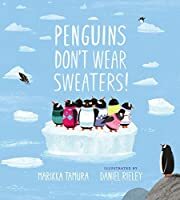 Our book today is Penguins Don’t Wear Sweaters, written by Marikka Tamura and illustrated by Daniel Rieley, a lovely story that combines adorable penguins with a message of environmentalism. The reader is introduced to a colony of playful penguins, living their best penguin lives. They swim and hunt for fish in the cool water, they let their fluffy feathers dry as they bask in the warm sun, they cuddle, waddle, play, and are happy. But one day, a tanker ship floats by and leaks icky black stuff into the water, which makes it no good for swimming and coats the penguins’ fluffy feathers in muck. Big Boots (humans) come to help, but the penguins are cold and scared. So the Big Boots put out a call to other Big Boots: knit sweaters for penguins! Adorable. First, the text is delightful to read aloud; the choice for the narrative to be in penguin “voice” – using short, simple sentences to emulate the penguins’ point of view – creates a joyful and innocent tone. There is a little confusion where the message is concerned, as the story is based on a real-life incident in which knitters were asked for sweaters after an oil spill in Australia, but the sweaters were ultimately found to not be beneficial to the recovering birds. The author makes note of this in her afterward, but the wording in story is vague enough that this point may not make it across to younger readers. However, its ultimately a story of how, regardless of carelessness or good intentions, penguins are at their happiest when humans don’t interfere at all, and they are left to just be penguins. That’s a solid message. Otherwise, the colorful and darling illustrations are perfect for the style, the length was good, and JJ loved it. A clever and cute cautionary tale against human interference, and it’s Baby Bookworm approved! Penguins are doing penguin activities in the arctic until a passing ship leaks oil into their pristine waters. They are soon gooped all over and their water doesn't right or feel right. They are found by "boots" who ask people to knit sweaters to protect the birds so that they can clean them up. So sometimes penguins do wear sweaters! Soon the "boots" release them into the wild again, care and sweater free. Based on a true story including at the end of the book the illustrations are darling. It i Penguins are doing penguin activities in the arctic until a passing ship leaks oil into their pristine waters. They are soon gooped all over and their water doesn't right or feel right. They are found by "boots" who ask people to knit sweaters to protect the birds so that they can clean them up. So sometimes penguins do wear sweaters! Soon the "boots" release them into the wild again, care and sweater free. This is NOT what I thought it would be about, lol. I thought it would be some goofy book about... I don't know... some old lady knitting penguins sweaters or something, but learning that penguins can just be themselves. They don't NEED sweaters. Turns out it's based on a news story that the author read about penguins being affected by an oil spill which caused them to need sweaters for a time because the oil affected the way that they could (or couldn't) control their body heat. Not wacky at all This is NOT what I thought it would be about, lol. I thought it would be some goofy book about... I don't know... some old lady knitting penguins sweaters or something, but learning that penguins can just be themselves. They don't NEED sweaters. The illustrations will catch young readers and parents attentions. Know that this is not another cute penguin story, it's an environmental story about taking care of penguins after an oil spill. (view spoiler)[The solution? To clothe the penguins in sweaters!? Only in the author section did this book explain how sweaters for penguins isn't a good idea. I also didn't like that it pretty much ignored the fact that there was an oil spill that is dangerous to animals. I understand it's a cute children's book about how adorable penguins look in sweaters but I think it could have served better with a bit more information within the pages and not just under the author's note. This book was not quite what I expected. This story is based on a true story about an oil spill in the arctic. Instead of cleaning up the spill and taking care of the penguins, people started knitting sweaters for the penguins. I thought the story was a little choppy and the author doesn't explain whether the sweaters helped/hurt until the end in the author's note. Adding this into the story would have been helpful for younger readers. Overall a good environmental story for children and adults. When a big oil spill threatens the penguins, people begin to knit sweaters to protect them from the oil. But after the photo shoot, the penguins lose the sweaters and dive back into the ocean. The backmatter tells the true story about a group of people who knit sweaters for the penguins but soon learned that the sweaters were bad for the other animals in the environment so now environmentalists use the sweaters people donate to raise money for the penguin relief. I absolutely LOVE this book! The story is true and very entertaining, but even more important to me, it speaks to the competence of children of all ages - able to understand problem solving and empathy even when well meaning adults don't go about things in the best of ways. Such a fun read - captivating - "Look at you, Penguin - wearing a sweater!" I can't wait until all the children (and adults I know) know about this wonderful book! More please, Marikka Tamura!!! This was an adorable yet educational title, and: YES, it is published by Penguin Young Readers! I like how it provides a good little story and a perfect way to start a conversation with young children (or not-so-young children) about ecological situations and animals. This would be great title to add to a penguin or polar storytime list, as well as a Penguin Awareness Day program (it's every January 20, in case you didn't know). Thanks to Penguin Young Readers for the review copy. 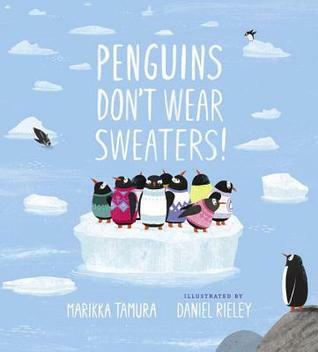 How I wish Tamura would have told the story about how and why she and her mother and sister knitted sweaters to save oil-soaked little blue penguins, as she describes in the Author’s Note. Instead, the story gets oily when the nameless, faceless “Big Boots” sweater knitters are introduced, turning what could have been a compelling story into a fragmented news bite. Clever illustrations, especially of the penguin wearing a Penguin Books logo, earn a third star. The illustrations of the penguins in their sweaters are so darn cute! It's a really cute fictitious story loosely based on an real event. I really liked how the author wrote in the end how the idea came about and how sweaters for penguins isn't ideal (it can actually hurt them and the creatures around them). The links on the same page are also helpful if you still want to learn more and/or help out penguins. Like many people, I picked this one up expecting a light fantasy story about cartoon penguins in sweaters. Instead, it contained a lesson about how oil spills affect wildlife such as penguins--and how people can help. The potentially upsetting subject matter is handled in a way that is extremely gentle, so much so that I think even the most sensitive kids will be able to enjoy and gain something from the book. Fabulous illustrations. The text and the story as a whole were less than stellar. Yes the environment in incredibly important but this presents it as a very blasé issue. Oh we destroyed the penguins habitat? Don’t worry five people will take two hours to knit some sweaters and it will all be fine. Ahem. Yeah. No consequences. This book surprised me because I did not think it was going to be a story about an oil spill. I found the author's note to be interesting and it filled in some of the questions I had about the story. I'm not sure all readers will pick up on the message of the story - or if they miss the author's note, not understand that sweaters aren't helpful. Super cute! And also a great message about good intentions not always working out well. This book is one of those borders between a picture book and non-fiction. 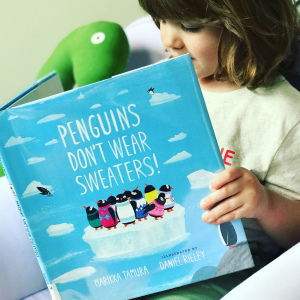 It will make a really great read aloud book, that will incite conversations about how cute the penguins are, but how the sweaters are bad for them. I’m torn. The cover illustration is SO CUTE but also... misleading? This would be neat during a science unit but I guess I’m just thrown off. I really thought this was just going to be an adorable fiction book about penguins in sweaters. Colorful, expressive and dynamic illustrations underscore a valuable message about the needs of animals in the environment. However, I found the writing a bit stilted without true cohesion. This book says that knitting sweaters for penguins can actually do MORE HARM THAN GOOD! WHAT?! I'm glad I learned something new today. Also, highly recommend this book for any environmental storytime.